This week setting of the week allows you to prefer a custom logon background image in Windows 7. 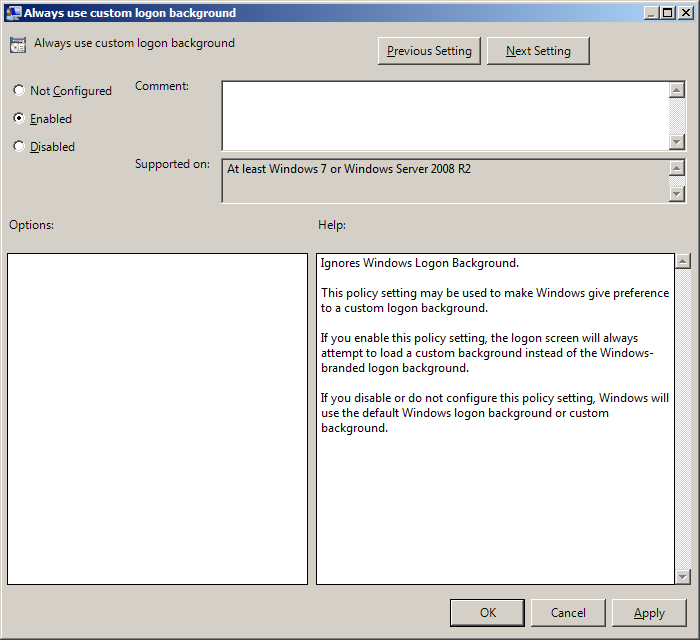 This setting is called “Always use custom logon background” and can be found under Computer Configuration > Policies > Administrative Templates > System > Logon. 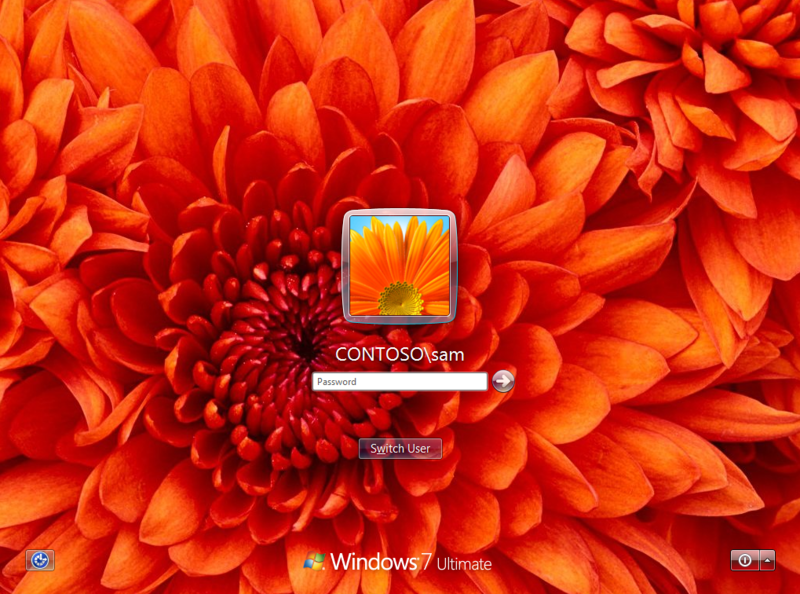 Microsoft brought back the option to easily customise the logon background in Windows 7 as this was previously possible in Windows XP but it was removed with Windows Vista which left people with some pretty messy workarounds. Once you have enabled this option all you have to do to create the “%windir%\system32\oobe\info\backgrounds” folder and populate it with a backgroundDefault.jpg image and your computer will then use that as the background image when logging on and off. 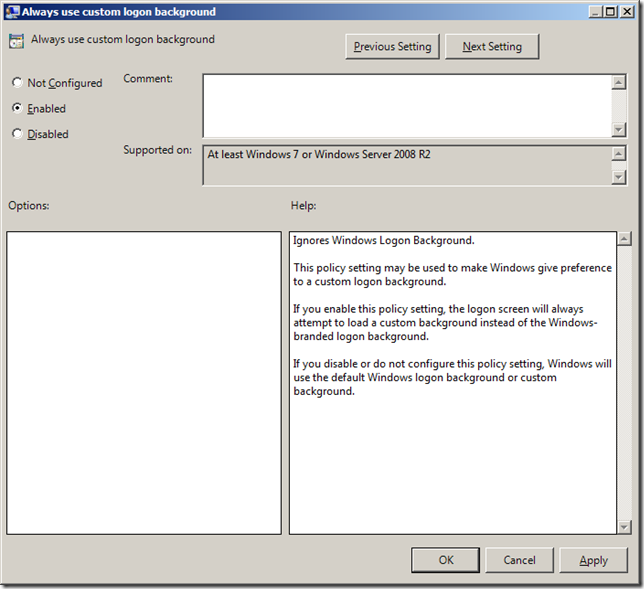 Note: Some sites will direct you to configured the OEMBackground or UseOEMBackground in the HKLM\Software\Microsoft\Windows\CurrentVersion\Authentication\LogonUI\Background however this setting will negate the need to set this key. This setting is applied only to Windows Client (Vista, 7)? It´s possible to apply Windows Server (2008 and 2008 r2)? Works With Windows Server 2008 R2. Thanks for the tip I still use my Windows 7 OS.